Social media is impacting every arena of our lives, from how we get directions to how we connect with friends to how we do business. For the HR leader, social media, mobile tools, web video and interactive technology have forever changed how we attract, retain, develop and engage talent. With all these new channels for communication with employees and candidates however, adapting the processes for hiring, learning, coaching and managing employee communications presents a huge challenge. 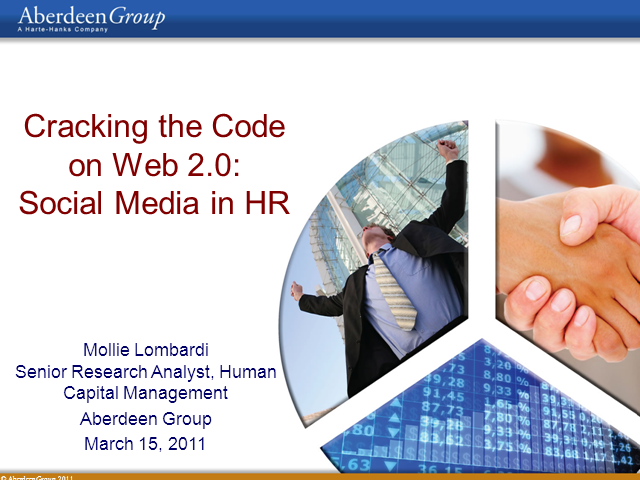 Ignoring social media in our dealings with employees is not the answer, but where can HR leaders start? Based on several recent studies from Aberdeen Group, Mollie Lombardi will share best practices, practical advice, and emerging trends for making the most of social media to deliver business results and enhance the employee experience. Presented by members of the VR/AR Association, a global industry group that has over 3900+ companies and universities registered and working together on best practices, guidelines, and standards. VR & AR is now used to train staff at companies like Walmart. Attend to learn more! Employee Engagement Pulse Surveys are critical to every employee engagement strategy. During this webinar, DecisionWise's President, Greg Zippi, along with David L. Mason, Director of I/O Psychology explore the benefits of using frequent pulse surveys as part of your employee listening strategy. David is an experienced Consultant and leads the I/O Psychology and Data Science learning and curriculum efforts at DecisionWise, and is responsible for the design of our training, facilitation, and workshops. He leads sessions throughout the world on employee engagement and workplace learning. Having completed a Ph.D. in Psychology at Columbia University, and undergraduate and graduate degrees in Psychology at Brigham Young University, Dr. Mason turns his understanding of adult learning and psychology into business concepts, working with numerous businesses and academic institutions. Prior to joining DecisionWise, David taught in the Department of Cognitive, Perceptual, and Brain Sciences at University College London. In addition to Dr. Mason’s strong presentation and facilitation skills, DecisionWise often taps into his extensive knowledge of statistics and research in developing and evaluating assessments. DecisionWise will help you understand how to create an engaged workforce. This is the age of the employee, and the majority of organizations are failing to meet their employee's expectations, why? The authors of the best selling book The Employee Experience will share best practices for improving the employee experience and creating engaged employees in your organization. --What are the different contracts we make with our employees can lead to expectation misalignment. --Company maturity impacts your employee experience strategy. All attendees will receive a free book signed by the authors. Dr. Tracy Maylett: Tracy's business, coaching, and consulting background extends over a period of two decades and across five continents.Tracy is the Chief Executive Officer of DecisionWise, and is responsible for guiding the overall strategy of DecisionWise, as well as leading large-scale change efforts for clients throughout the globe. Matt Wride, JD:As DecisionWise’s Chief Operating Officer and executive consultant, Matt oversees the company’s operations, as well as its finance, legal, and administrative functions. He consults with executives around the globe on creating employee engagement at the organizational, team, and individual levels.